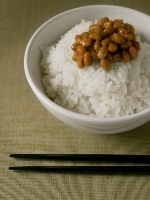 Studies have shown that the Japanese food natto has implications in the fight against breast cancer and osteoporosis. One big reason is its vitamin K content. Here is part two, the finale, of our look at this food cure. As a reminder, natto is made of fermented soybean using Bacillus subtilis natto. Breast cancer claims three-times as many women in America than it does in Japan. The Japanese also have lower rates of colon and prostate cancer, and scientists attribute this difference between the two cultures to diet. Japanese people tend to consume more soy phytoestrogens, which could account for the difference. In Asian studies, it has been shown that women who eat foods with soy, such as natto, tend to have lower incidences of breast cancer. Along with cancer protection, phytoestrogen can also help reduce symptoms of menopause, such as hot flashes. In one study, researchers found that genistein could reduce hot flashes by 45%. The study involved 104 postmenopausal women who added 76 mg of soy isoflavones to their diet (including 40 mg of naturally occurring genistein). Besides helping with symptoms of menopause and breast cancer, natto can also help with another condition that tends to affect more women than men—osteoporosis. Natto is high in vitamin K, which has been found to help prevent osteoporosis by maintaining good bone health. While vitamin K is found in many foods, including certain dairy and meat products, natto happens to contain a specific form—vitamin K2. This vitamin makes up only 10% of vitamin K in a typical American diet. Researchers followed 944 healthy women for three years, tracking their consumption of natto, tofu, and other soy-based foods. The women’s bone mass density was measured at the start and the end of the study. They found that among postmenopausal women who ate at least 40 g of natto a week, there was a reduction in bone density loss. The researchers also found that this protective effect of the foods in the study increased when a woman aged as well. This two-part series shows that soy might have terrific health benefits for many adults, most notably aging women. One big reason is the food natto. “Cancer Facts & Figures—1998,” American Cancer Society, 1998. Albertazzi, P., “The effect of dietary soy supplementation on hot flushes.” Obstet & Gynecol January 1998; 91(1): 6–11. Ikeda, Y., et al., “Intake of Fermented Soybeans, Natto, Is Associated with Reduced Bone Loss in Postmenopausal Women: Japanese Population-Based Osteoporosis (JPOS) Study,” Journal of Nutrition May 2006; 136: 1,323–1,328.